I’m holding my new flippers. Quick! Time is racing past. Australia Day. The sky is clear. With such a noisy crowd. For beach dogs aren’t allowed. Happy Anniversary to Australia at the Beach! Ten years is a great achievement. For many Australians trips to the beach are part of every summer. For those lucky enough to live within cooee of the coast, this can be a daily excursion over summer. For others it’s a holiday treat. But for the family in Australia at the Beach this is an Australia Day outing. There’s Mum and Dad, Grandad, a boy, a girl and baby William. The journey, recounted in rhyme and illustrated in bright beach colours, begins with the loading of the car. The adventure continues through the day with swimming, building sandcastles and more until finally, it’s time to go home. Throughout, William makes his presence felt, with lost sandals, nappy changes and much more. Little aside vignettes share ‘beach etiquette tips’. Australians love their beaches and rightly so. In a hot dry country, the cool ocean is a natural retreat. Max Fatchen and Tom Jellett provide a day at the beach that will resonate with adults and children alike. There’s the paraphernalia required, the journey and the carparking before the magic land that is the beach. There is no age limit to enjoyment of the beach and each double spread is full of Australians young and old. The narrator is the young boy of the family who though occasionally exasperated by his baby brother, keeps an eye out for him. Many readers will recognise experiences from their childhood. Australia at the Beach is ageless. Despite a changing world, the simplicity of water and sand will continue to attract all ages. 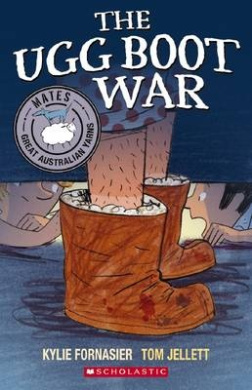 Recommended for preschool and early primary readers.